(Galerie Terrades, Paris); purchased 2003 by NGA. Colorful Impressions: The Printmaking Revolution in Eighteenth-Century France, National Gallery of Art, Washington, 2003-2004, no. 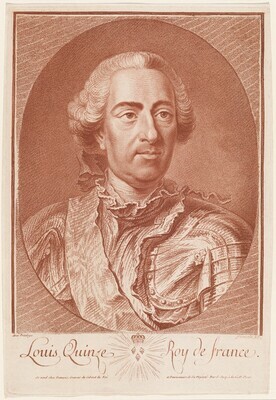 15, as Louis Quinze, Roy de France (Louis XV) by Jean-Charles François. Antoine Cahen, Galerie Terrades. Paris, 2002: no. 12. Colorful Impressions: The Printmaking Revolution in Eighteenth-Century France. Exh. cat. National Gallery of Art, Washington, 2003-2004: no. 15.